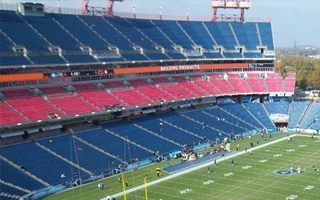 As many Tennessee Titans fans noticed, seats are rapidly disappearing from upper decks of Nissan Stadium. All of nearly 70,000 seats will be replaced come summer, some already by March, when women’s football/soccer tournament of four national teams is planned. Contrary to wishes by some Titans supporters, no seats will be available for purchase as souvenirs. They’re being recycled and selling plastic/metal parts for repurposing should help recoup some of the $15 million spent for the redevelopment. Most of the budget will be paid off by fans, who are paying a $3 tax from every ticket to the stadium. Aside from seat replacement, also the facades are changing. “It’s been so gray from the outside,” said Titans Vice President of Facilities Bob Flynn, “so we are giving it more color.” Bright red paint is being added to ramps, entrances and signage. The project will include replacement of the facilities expansion joints which have aged to a point where there were leaks from upper to lower decks during heavy rains.